(by the Editors, The Wall Street Journal) – Americans have long associated the fight against Islamist terrorism with the Middle East, as Sunday’s attack in the Turkish capital of Ankara reminds us. But that geographical horizon is also increasingly out of date. Witness the expanding grip of jihadists in Africa—and the Obama Administration’s belated but increasingly urgent attempts to fight it. Ostensibly, U.S. Special Forces are in Somalia to train and assist the African Union Mission in Somalia, or Amisom, which helps Somalia’s federal government. 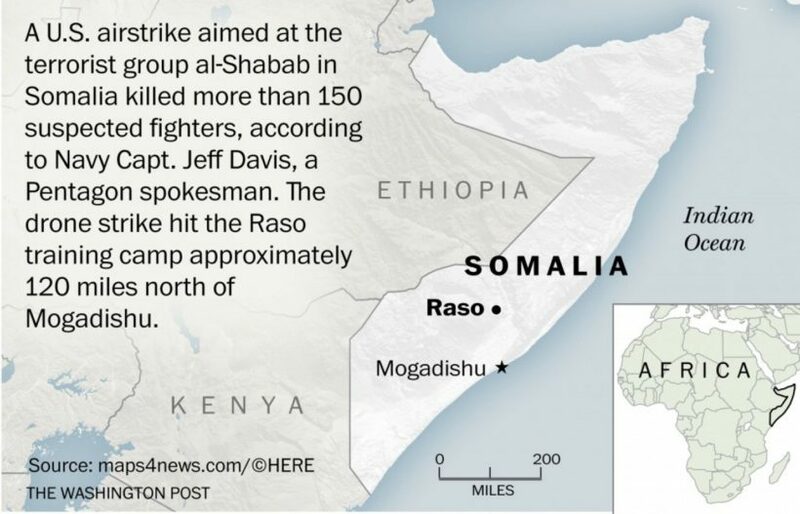 Shabaab is a menace to all of East Africa, with outrages including the 2013 attack on the Westgate Mall in Nairobi and last year’s rampage at Kenya’s Garissa College that massacred 148 Christian students. But Shabaab is also a menace to the West. A Shabaab member tried to kill Danish cartoonist Kurt Westergaard in 2010 with an ax in revenge for drawing the prophet Mohammed. Shirwa Ahmed of Minneapolis became the first known American suicide bomber when he drove a truck bomb into a Somali government compound, killing 20. An estimated 40 U.S. citizens have traveled to Somalia to join Shabaab, which has called for attacks on U.S. shopping malls. If Islamic State can radicalize the San Bernardino killers from afar, Shabaab can do the same. The Obama Administration has sent 300 troops to Cameroon to fight the Islamist terrorists of Boko Haram in neighboring Nigeria, and it’s an open secret that the U.S. operates a drone base in Garoua in northern Cameroon. A U.S. air strike last month near the Libyan city of Sabratha killed an Islamic State leader and 48 terrorist comrades, and the Pentagon is reported to be drawing up plans for a broader air campaign against Islamic State in Libya. In 2013 the U.S. set up a drone base in Niger, which has borders with Nigeria, Algeria, Mali and Libya—all of which have had major jihadist uprisings. Niger may become particularly important in the fight against a resurgent al Qaeda in the Maghreb, which has recently perpetrated attacks on Western targets in Burkina Faso, Mali and, on Sunday, in the Ivory Coast. Altogether, the U.S. operates surveillance flights from about 12 small sites in Africa. Camp Lemonnier, in Djibouti, the only permanent U.S. base in Africa, is home to several thousand personnel. The question is whether this is enough. The Bush Administration established the U.S. Africa Command in 2007 as one of the Pentagon’s six geographic combatant commands, but it is still only 2,000 military, civilian and contractor personnel, most stationed in Germany. If you judge by his recent interviews, President Obama considers his intervention in Libya to be the biggest mistake of his Presidency, and the White House has resisted calls to launch major strikes on Islamic State’s Libya bases. The risk here—as with the Administration’s half-hearted antiterror fights in Yemen, Iraq, Syria and Afghanistan—is that the U.S will keep playing catch up against a threat growing faster than we can destroy or even contain it. The U.S. treated Boko Haram as mostly a local threat until it pledged allegiance to Islamic State last year. Then-U.N. Ambassador Susan Rice dismissed French pleas to act until Mali was nearly overrun by al Qaeda; it was saved thanks to François Hollande ’s decision to send troops. The U.S. can’t counter every potential terrorist threat in Africa, but that doesn’t mean it can’t do more. An aggressive campaign against Islamic State-controlled territory in Libya would remove a clear danger to Africa and Europe and signal that the U.S. won’t tolerate terrorist groups seeking statelets of their own. Strikes against Shabaab in Somalia and Boko in Nigeria would strengthen legitimate governments. All of this requires greater resources—a reminder that global security depends on a well-funded U.S. military with the ships, planes and manpower to meet current and emerging threats. That’s a far cry from what Mr. Obama will bequeath his successor, who will have to rebuild America’s strengths lest the Mideasternization of Africa become a template for the spread of jihad everywhere. Published March 15, 2016 at The Wall Street Journal. Reprinted here March 17, 2016 for educational purposes only. Visit the website at wsj .com. 1. List the three main terrorist groups operating throughout various countries in Africa. 4. Re-read the suggested solution from para. 10. Ask a parent: do you agree with this suggestion? Explain your answer. a) Do you agree with assertion made in paragraph 11? Explain your answer. b) Which presidential candidate do you think would do the best job of effectively combating the spread of these terrorist groups throughout Africa? Is this necessary to ultimately protect the American people? Or do you think he/she should continue President Obama’s current course of action? Explain your answer.